When I was 29 and pregnant for the first time, I noticed "lumps" on my thighs. The doctor said they were external clots, and I gave myself heparin shots for the duration of the pregnancy and for 6 weeks after. My doctor told me never to go back on birth control. I had several surgeries after that situation, but never any problems. Then, at the age of 55, I went on "bioidentical hormones" to help with menopause. A week after going on the pills, I went on a 12 hour car trip to Texas for 4 days. My sister that I was traveling with came down with a cold, and when we started the road trip back, I was coughing a lot, but thought it was a start of a cold. We were in Amarillo, TX for the evening when the coughing got much worse, out of control. My sister asked if I thought I needed to go to an emergency room, and I had the feeling I should. She ran into a store to find out where an emergency room was, and by the time she came back to the car, I was having extreme breathing difficulty. I could not get enough air into my lungs to talk, so when she asked if I needed an ambulance, all I could do was shake my head yes. She ran back into the store to call an ambulance, and afterwards, she told me she thought I would be dead when she came back to the car. As I waited for the ambulance and was desperately struggling to breathe, I leaned over the front seat of the van, and that seemed to open up my lungs just a tiny bit, enough to get to the hospital. The emergency room did a few tests, but could not find anything, and by that time, my breathing had become more regular. I checked with my regular doctor upon coming home, but no one had an answer for what had happened. Two weeks later, my left calf was swollen and hurting, but I was busy with my business, and just ignored it. 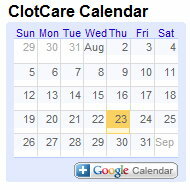 Next morning, it was worse, so I went to the doctor where they found a large clot in my left leg. There were also remnants of clots in both lungs. I was put on Coumadin, and because it was my second incident, was tested for genetic disorders. I have Factor V Leiden. I was on Coumadin for 5 years, and made the decision to discontinue. I have been okay ever since, but web sites such as this one are so beneficial in educating people in how to watch for signs of new clots, and how to take prudent precautions on road trips, etc. I never forget that I'm lucky to be alive, and appreciate life to the fullest. This summer, for the second year in a row, I will be climbing a 14'er mountain peak in Colorado. In retrospect, I am surprised the doctors did not detect the lung clots sooner, or even check for them, so we need to continue to educate, educate, educate.